The news came from a somber release on HTC's website, without any of the usual fanfare. Analysts reaction compiled by Bloomberg blame the drop on delays for the flagship One phone, which has now been pushed into an April launch in the US and other markets. Even with a delay of just a few weeks, HTC can't claim sales for the first quarter, though nearly all the manufacturing costs are realized within the three-month window. 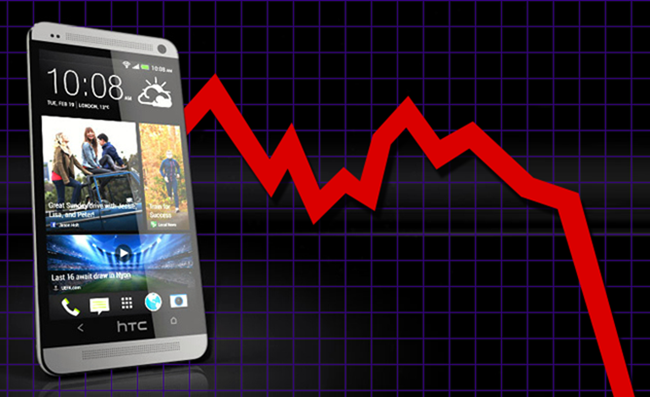 HTC has lost more than two-thirds of its market value in the last two years. There's no two ways about it: things look pretty bleak for HTC at the moment. If the One sees the same lukewarm response as the One X, One S, et cetera from last year, the company will be in bad shape. It's a startling fall for HTC, which at one point was arguably the largest and most well-regarded smartphone manufacturer outside of RIM. For a little perspective, HTC was fourth for calendar year 2012 smartphone shipments with a 6% worldwide share, behind Nokia and tied with RIM/Blackberry. Samsung claims the #1 spot with 39.6%. Things are a little better in the US, but even here, HTC has less than half of Samsung's marketshare and just 9.3% total. A few months can make a big difference - with the meteoric rise of Samsung, HTC is on the brink of a marketshare collapse, especially if it can't successfully counter the Galaxy S4. Increasing competition from smaller players like Huawei, Sony, and ZTE is exerting even more pressure. Still, things could be worse. The company is posting a profit, after all, and the loss in footing this quarter could be successfully turned around in Q2, assuming steady sales of existing and new stock. The HTC First, the first (natch) in a new series of Facebook Home-focused smartphones, could open up new territory in the low and midrange. The rest of 2013 will be crucial for HTC's continued viability.